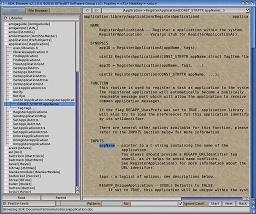 It can help you find the format (prototype) for any AmigaOS4(tm) system call as well as lookup a specific structure reference, method, tag item, what-have-you, quicker than any other tool. Or, you can simply use it as a great way to wander through the AmigaOS4(tm) development documentation (AutoDocs, Includes, etc.) to learn more about how to program for this great machine and its powerful operating system. There is a great deal of (largely untapped) power available with the "standard" OS if you only know where to look. See the FEATURES and README / About pages for more details.